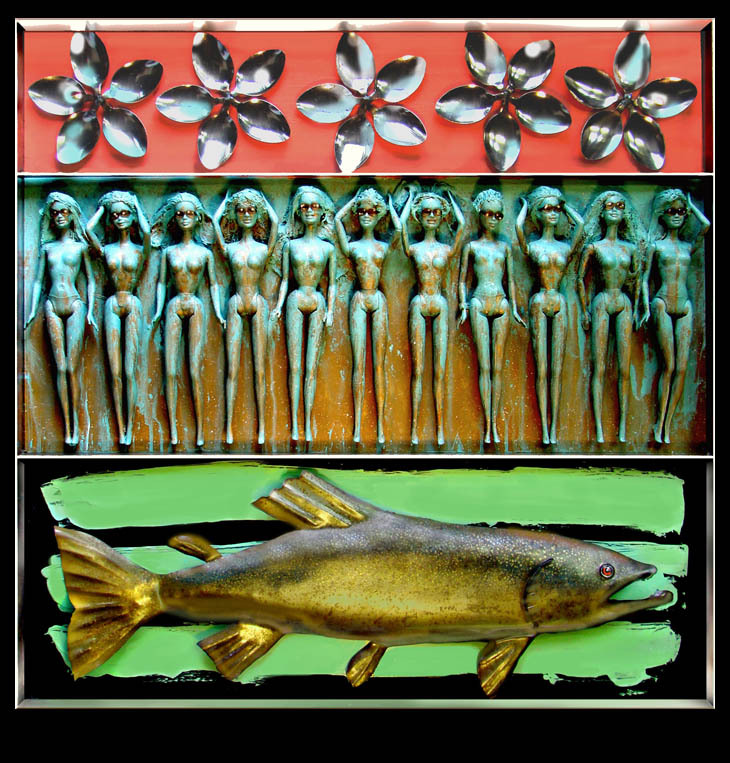 An eclectic restlessness fuels Donald Gialanella’s artwork as he reclaims objects and conjures a nostalgic awareness of the cultures in which he is embedded. 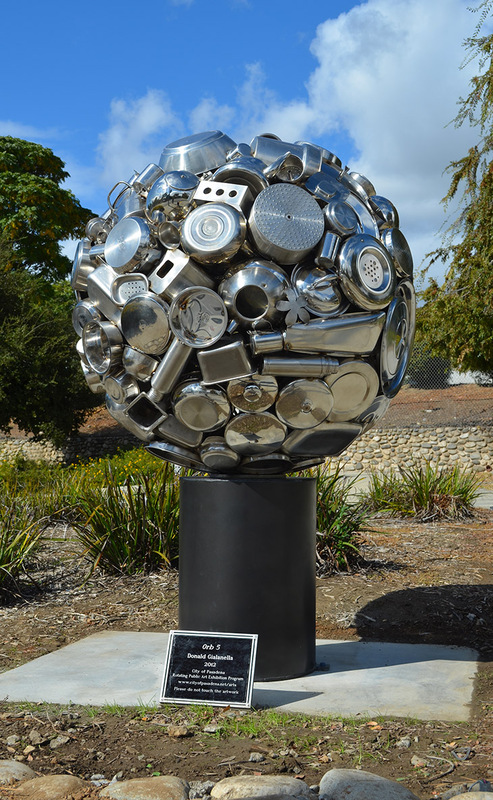 Gialanella is known for his use of household objects such as spoons, pots, and pans in constructing monumental public sculptures. In his private work, Gialanella goes so far as to compare the reuse of objects in an artistic setting to Buddhist reincarnation. The works pair a shrewd sensibility for displaying the contemporary moment with commentaries on the universality of utilitarian objects to develop the kind of discussion that so unfortunately eludes many contemporary artists: pop art that thinks. Gialanella’s works are dizzyingly intricate, filled with materials loaded with cultural significance and masterful, poetic metalwork. Gialanella, who holds an Emmy for his work on Monday Night Football and a BFA from the Cooper Union, lives and works in Los Angeles. Having taught internationally at Bilkent University in Turkey, Gialanella has returned to public sculpture. His sculptures can be found in Napa, CA; Pasadena, CA; and Albany, NY with a forthcoming piece to be installed at the Lucille Packard Children’s Hospital on the campus of Stanford Unversity in Palo Alto, CA. Last year, he was included in shows at the ADC/Building Bridges Gallery in Bergamot Station, Santa Monica and the Orange County Center for Contemporary Art in Santa Ana, CA. Gialanella’s artwork can also be found on his website. 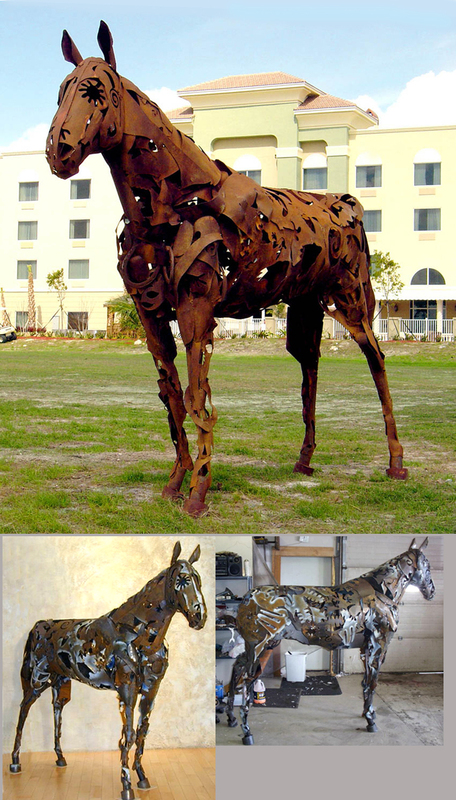 Tell us about your interest in creating sculptures out of recycled and reclaimed objects. Where did this inspiration come from? I have been working with recycled and reclaimed materials for decades now and can’t put my finger on exactly why I’m drawn to these objects. 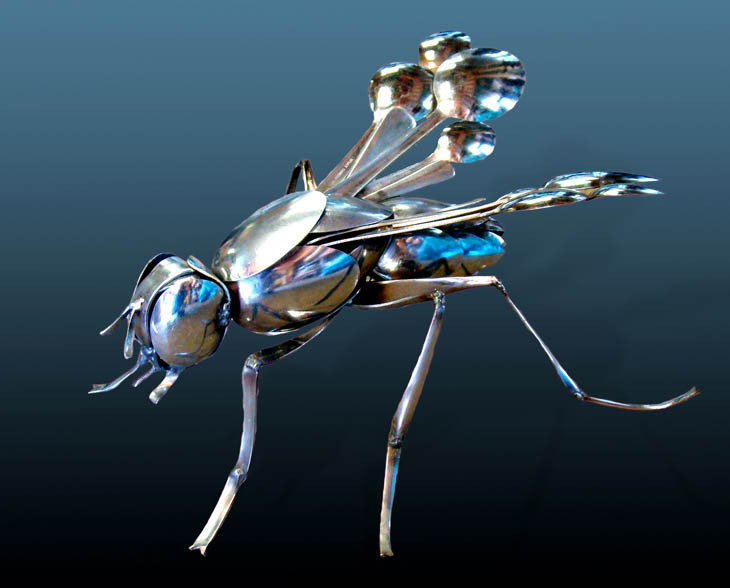 What I can say is that I have a deep connection to working with odd assemblages of objects, and I enjoy act of shaping metal. When I begin to work with these materials, I feel the juices flowing and enter into a kind of creative rapture. The process is beyond logic. I can begin working, and something poetic grabs me, and changes me, and the work begins to exist on its own terms. I am there as a medium to guide the process. 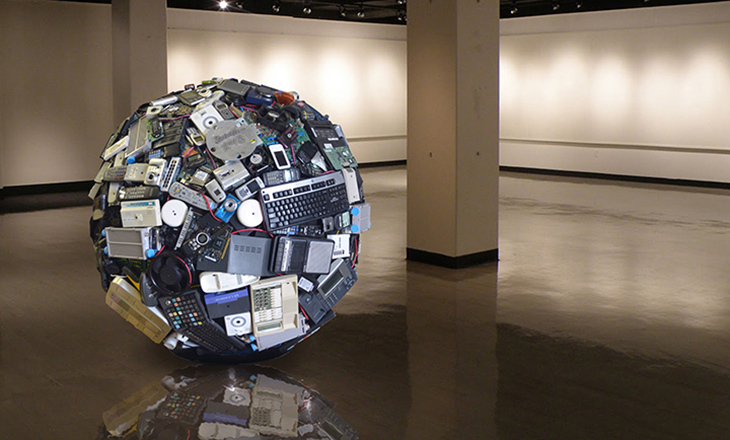 The inspiration to use discarded objects to make art started when I was a boy. I used to rummage around in the scrap box underneath my dad’s table saw. I would take these odd shaped bits of wood and glue them together to create little figures of eskimos, genies, knights and animals. Looking at things differently is the role of the artist. Art reflects our culture and offers a new perspective about ourselves and the world we live in. When I see discarded objects, I think about them as raw materials for art. I look at trash differently than the average person. 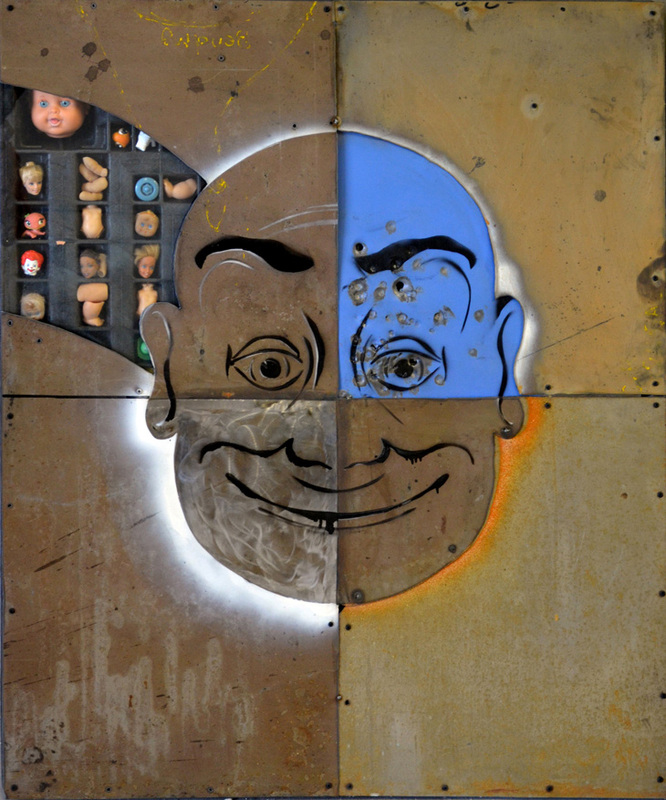 In your LA BUDDHA and LIBIDO works, you introduce the two-dimensional painted surface to these reclaimed objects. I read The Buddha as a symbol, perhaps one for the Buddhist concept or reincarnation, in association with your way of giving new life to objects. Are you consciously constructing these symbolic webs? The Buddha series serves as metaphor for the reincarnation of the objects that lived their initial lives and are returning in new lives. 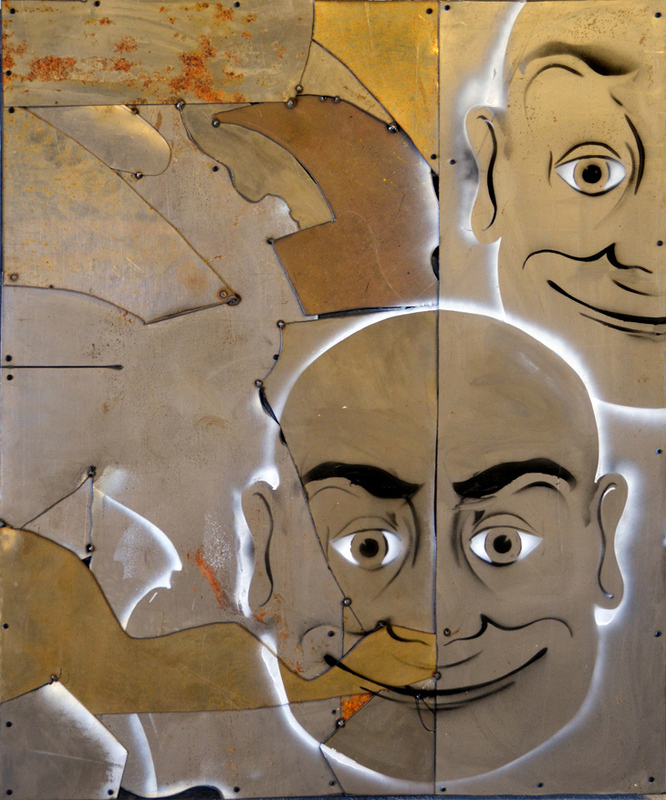 I used a two-dimensional or low-relief approach to these wall-hung assemblages. The pieces explore the problematic juxtaposition of planned obsolescence versus modernity and substance over spirituality. It explores our relationship to materialism and probes how we look at permanence. What emerge are ideas that prompt the viewer to ponder environmental responsibility and our cultural relationship to waste and sustainability. What is your reasoning behind the use of multiple common objects, like spoons and gears, to create your assemblage sculptures? The commonplace things we use every day are important elements in our lives: pots, pans, silverware, dog bowls, coffee cups. We have a relationship with them, a kind of emotional bond. We use them to nourish ourselves, to cook with, to put food in our mouths, and to drink out of. They are an extension of our humanity. People’s connection to these mass-produced utilitarian objects fascinates me. I’m interested in their lifecycle, the almost living lifecycle of the modern object: production, marketing, ownership, and destruction in the end. That’s the typical story of these modern objects. I interrupt this story by using accumulations of these objects in my art. By disrupting an object’s normal lifecycle, one looks at things differently. A spoon is not just a spoon anymore. A pot is not just a pot. The object’s normal lifecycle is interrupted by using it as an element in my sculpture. It is saved from destruction. It is frozen in time. When it is embedded in an assemblage, you stop the moment. You see it as a memory of objects that nurtured you all your life. Your Youtube account, livesteel, features a wide variety of videos from your own art exhibitions to bison running from a volcano and a mysterious space ball dropping on Namibia. Some of the videos on the odd side have gone viral, gaining millions of views. Is this some kind of elaborate ruse, a foray into video art, or are these just videos you’ve taken and compiled out of your own interest? The Youtube channel contains an eclectic mix of videos that range from a slightly skewed look at natural phenomena to some not-so-mainstream people at the fringe. I do think of them as video art. The content is hard to categorize, as some are satirical send-ups or cartoon-like puns, some are re-edits of available footage, some are raw video of events I shot, and some are elaborate video productions involving a crew and post-production facilities. These videos are both an offbeat way of telling stories and a way to illuminate environmental issues I am concerned about. It all started when I photographed a desiccated dead dog I came across while hiking in the high desert of Taos, NM. I put a move on the still photo and posted it as a short video on Youtube. It got a million views and was embraced by the cryptozoologists and conspiracy theorists alike. I made some obvious parodies after that which also garnered big views, the humor in them being largely ignored by people looking for proof of the existence of monsters and aliens. One section of the channel is dedicated to my art videos, showing a glimpse into the creative process as well as time-lapse creation of artwork, painting videos, welding, art events, and commentary. The sculptures seem to take on the influences of the previous uses for the objects you incorporate, intrinsically loaded with cultural values. As such, the places you find these objects impacts the meaning of the work. What are some of your favorite places to find the objects you use for your sculptures? I am always on the lookout for materials where ever I go. It’s a bit of an obsession. House sales, garbage cans, the side of the road, flea markets, auctions, auto repair shops and scrap yards are all places where I find interesting objects. Sometimes I buy things in bulk, a gross of spoons or coffee creamers. A toy drive was held at the Lucile Packard Children’s Hospital to gather hundreds of toys needed for building the assemblage cow sculpture I’m creating. The drive yielded seven very large boxes of toys that ranged from matchbox cars, dolls and action figures, to transformers, Legos, animals, and Sponge Bobs. The toys then have to be processed in order to be able to use, meaning I have to remove all batteries and sort by size, color and material. This makes the search for a particular shape and color toy much easier during the application of the toys to the cow armature, or what I call populating the surface. A Los Angeles filmmaker, Scott Trosclair, is making a documentary that shows the entire process of building the cow, from inception to installation. What originally drew you to creating public sculptures and expanding out from the commercial gallery art scene? Twenty years ago, commercial galleries were the main outlet for art sales. Today, that has changed. It just doesn’t make much sense for an artist to give away 50% or even 60% of his sales to the gallery. With the visibility afforded by an online presence, the artist can now present their work to a large audience more affordably than brick and mortar gallery prices. It’s a win/win situation for the artist and their clients. When I lived in Taos, I met artist Larry Bell, who had studios in both Taos, NM and Venice Beach, CA. I remember him referring to galleries as “upscale consignment shops.” That about sums it up. However, there is a clear distinction to be made between commercial galleries, the consignment shops if you will, and the academic/museum quality galleries that show cutting-edge work and site-specific installations. This past summer I was part of an exhibition, Art and Democracy V, at the ADC/Building Bridges Gallery in Bergamot Station, Santa Monica. Also, last summer, my work was included in a three-person show at OCCCA (The Orange County Center for Contemporary Art) in Santa Ana, CA. You have quite a bit of experience working with art in a public setting, including your time working with graphics at ABC-TV in New York. Do you see any ways in which your current art reflects your older work with graphics, either in process or in thought? My background in computer graphics has helped me greatly as an artist by allowing me to understand and use digital tools that can visualize and communicate ideas through compelling images. The process of designing a TV project and a sculpture begin in the same way – with sketches to work out the preliminary ideas. There is nothing better than a drawing to quickly realize your design. It’s a valuable skill to be able to draw something in a simple and direct way that contains the basic form and layout of your idea. Every creative endeavor can benefit from making early adjustments on paper before progressing to construction. It’s easier to use an eraser than it is to use a bulldozer. Public sculptures are intriguing because they exist more directly for people outside of the art world. For instance, it isn’t uncommon to see children climbing around on public sculptures or people staring out of their car windows at them. Do you ever return to the sites of your public works to see how the public interacts with them? 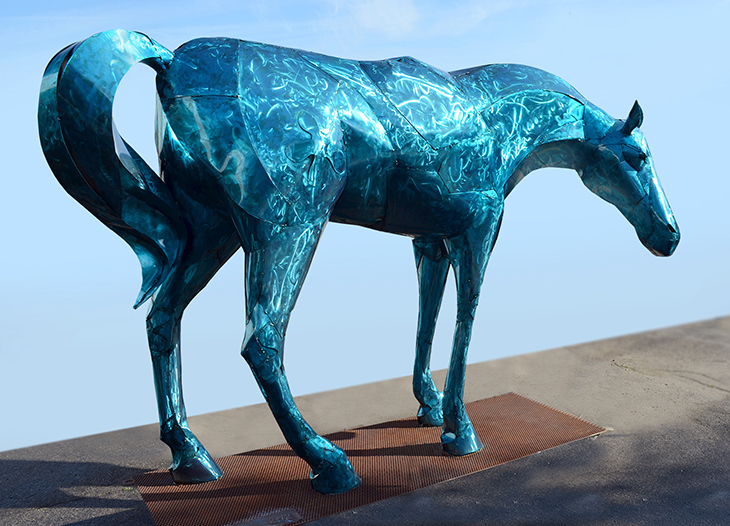 I enjoy seeing my work in the public arena, but I usually don’t have the luxury of revisiting the sites after installation unless the sculptures are damaged, which is exactly what happened to a piece installed on Main Street in Napa, CA. 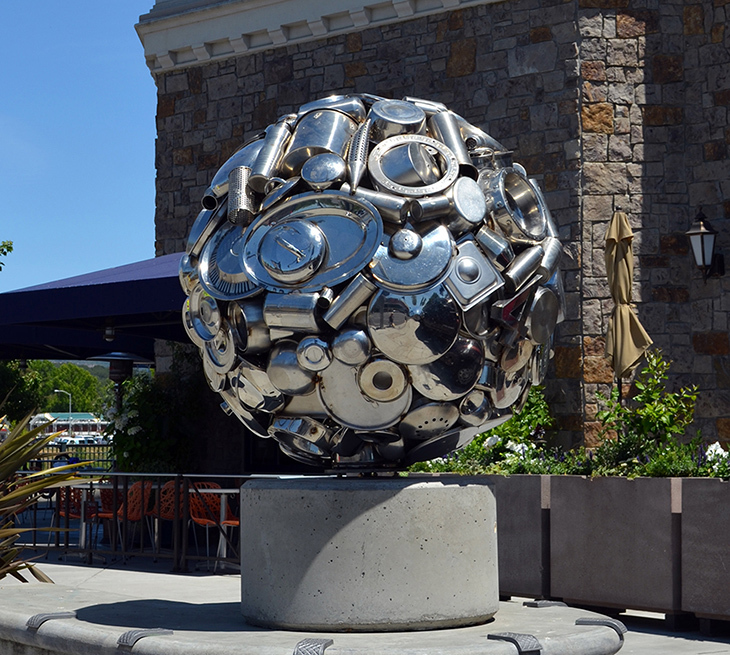 After the sculpture had been up for over a year, I received a call that vandals had gotten on top of the stainless steel orb overnight and rocked back and forth until it was loose on the base and listing to one side. I had to fly up and repair it. The incident taught me a valuable lesson: you must over-engineer outdoor sculpture to be able to withstand the vagaries of public display. That brings up another point. There is really no way to make a piece of art completely damage-proof. Public sculpture is susceptible from taggers and vandals 24/7. The only thing that can dissuade attacks is the very public and visible placement of the piece, adequate lighting at night, and solid construction and mounting. But, again, nothing is immune. You must run into a wide range of structural issues when constructing these sculptures. What are the challenges of building a chassis or armature for some of these works? When commissioned to do a public sculpture, it is imperative to have a structural engineer work out details of how weight and size stress the armature and base attachment. Public safety and durability are of paramount concern. Based on the engineering report, I use the specified gauge of materials and recommended welding certification. The larger the sculpture is, the more challenging it is to construct. It’s many times more difficult to build an eight foot tall sculpture than a four foot tall piece. Safety in the studio is a primary concern as plasma cutting, welding, grinding, and manipulating heavy objects are all inherently dangerous operations. A new project I am doing in Blue Springs, MO, involves two large pieces of 1/4” thick steel that weigh in excess of 500 lbs. each being delivered to my studio. 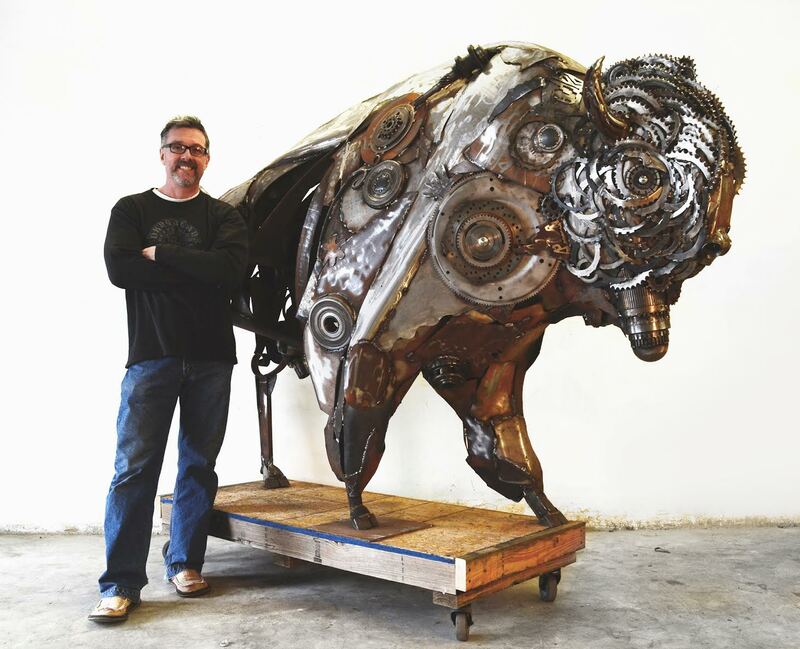 The final sculpture will weigh over half a ton. How does your work function within a gallery space? Do you create the same kind of work for a gallery or academic space as you do for public works? I approach public art design by focusing on the goals of the project, analyzing usage of the site as it relates to the local culture and community, and finally developing a plan of action to fulfill and balance the complexities of the project effectively and compellingly. My goal is to implement public art in a way that has a lasting positive impact on the local community. This is a much different process from mounting a gallery show. A gallery show is usually a more personal statement with work that is created with an introspective motivation. It’s a chance to experiment and get feedback about new ideas. Which artist, either historical or contemporary, do you feel has had the greatest impact on your work? I had the privilege of learning from some well-known artists while I was earning my BFA at The Cooper Union in the late ’70s. My teachers read like a Who’s Who of contemporary art. I studied with Hans Haacke and Vito Acconci, Kenneth Snelson, Jim Dine and Louise Bourgeois. But the greatest impact on my career was made by Louise Bourgeois, who asked me to become her assistant after graduation. I made several more portals in the walls of her house over the years. She used to scurry through these odd shaped archways to escape from exasperated gallery owners and art dealers. Please view Donald Gialanella’s website and “like” Critique Collective on Facebook at http://www.facebook.com/critiquecollective.